After putting together a collection of the top 100 best gun room designs awhile ago, I decided to embark on a journey of building my own. 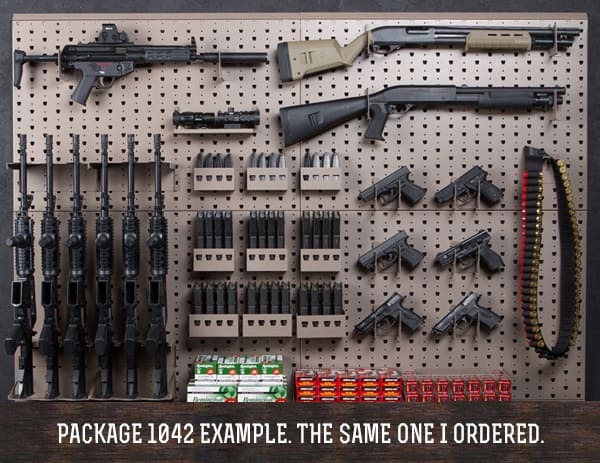 To start, I needed a wall rack solution to organize my firearm collection. 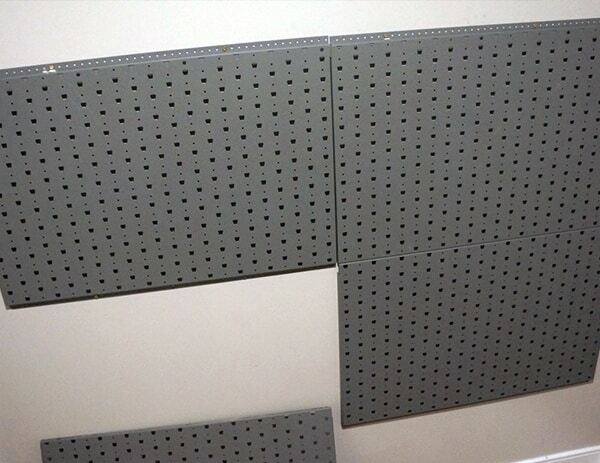 After doing some research and making comparisons against the traditional slat and peg board, I came across Gallow Tech. 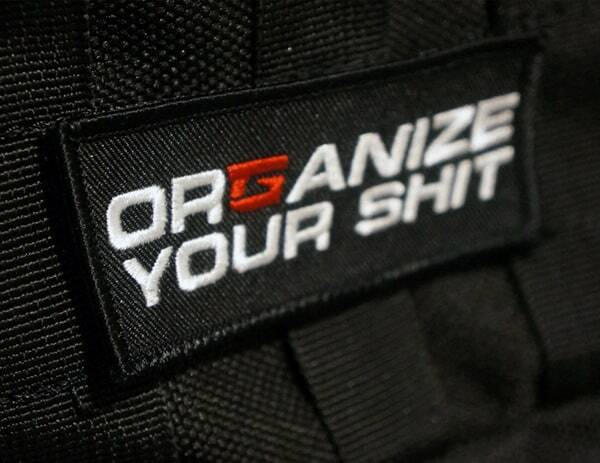 Once I saw their innovative design and learned more about the functionality behind it I knew I had found a winner. 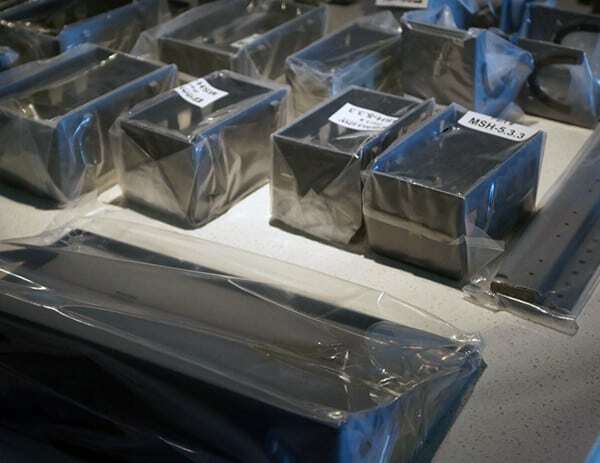 With that said, I went ahead and place an order for the Package 1042. 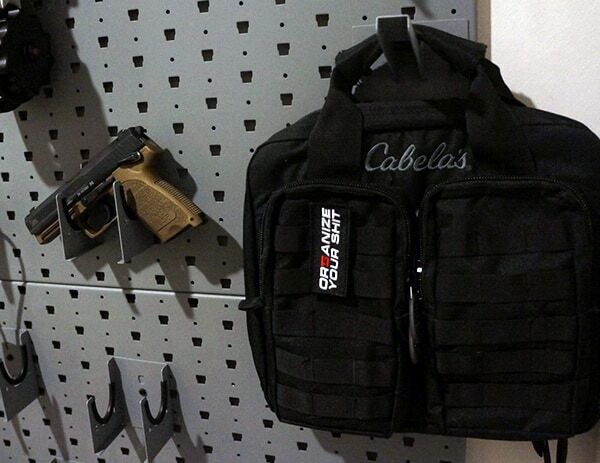 It features 4 wide wall panels and holds 3 rifles horizontally, 6 rifles vertically and 6 handguns. 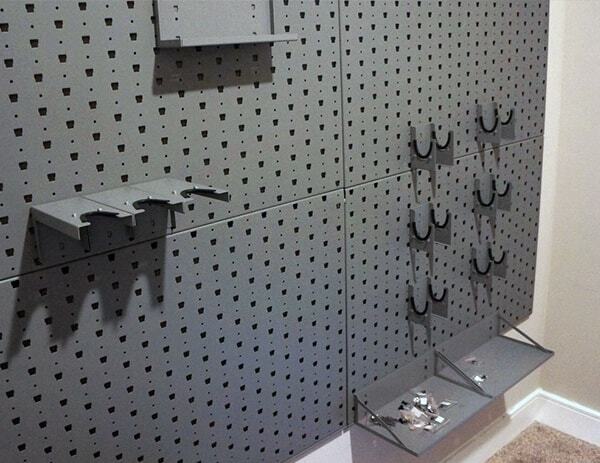 That’s in addition to magazine storage, an accessory hook, misc storage shelving and so on. 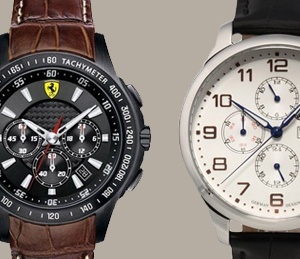 In short, it has a little bit of everything for a lot of variety and customization. For less than the price of my burnt bronze cerakote HK USP 9, I was able to get the entire packaged shipped to my door. Unbelievable value. 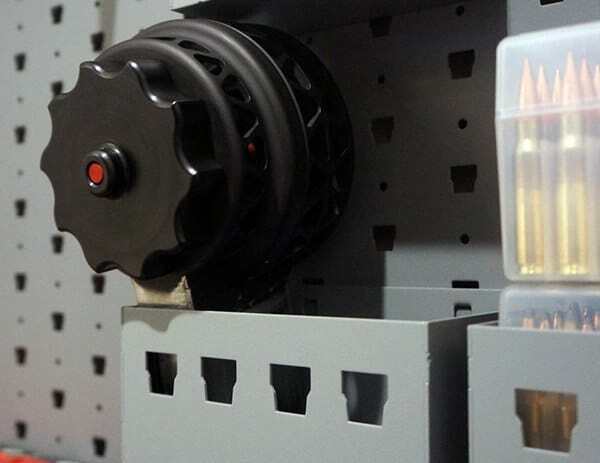 Of course, you can also order single parts at a time and build your own, or have them create a full custom gun vault on a grand scale. Regardless of which you choose, here’s how my experience went. These guys work fast with great customer service to match! I placed an order on Friday and it was here at my door on Tuesday. That’s including the Easter holiday weekend. Delivered were 3 separate, heavily-constructed cardboard boxes; all totaling to a weight of 120 pounds. With a little help from my Polish Hound, I started the unboxing process. 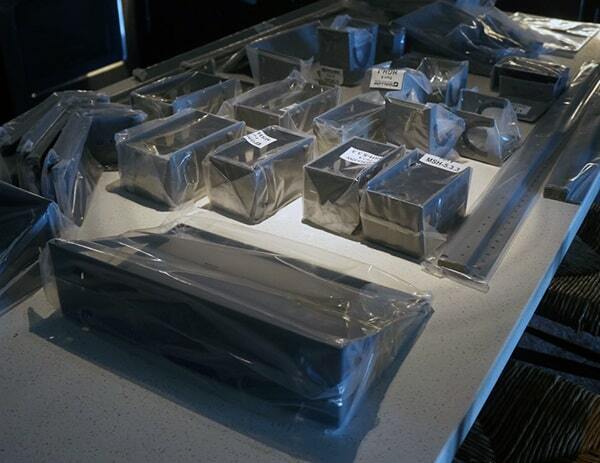 Every single item was neatly wrapped in a protective plastic, labeled and surprisingly very well-organized. 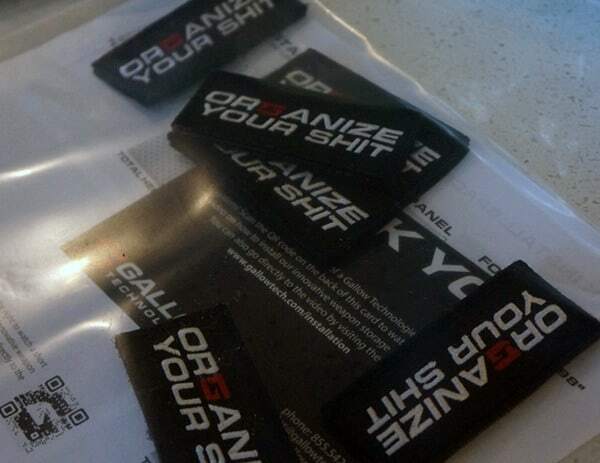 Included were two sets of instructions, a thank you card and some really sharp-looking morale patches as a cool bonus. After going over the installation process, I have to say it’s just downright simple. 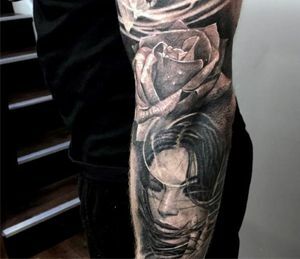 There is literally no technical knowledge required; virtually anyone can do this. 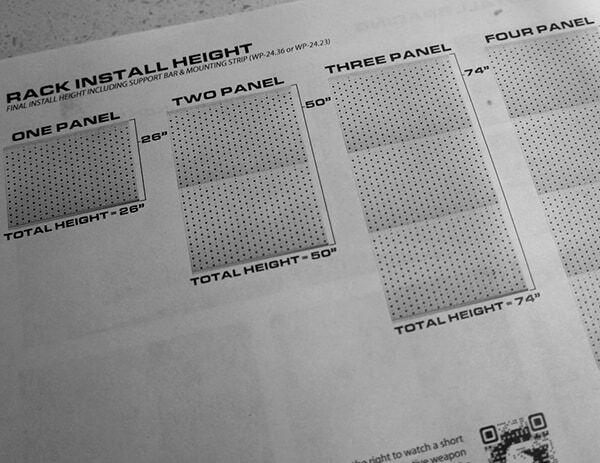 For my install I went with 3″ #10 construction screws, though, 2.5″ #9 would have also been acceptable. Just keep in mind that drywall itself is 5/8 inches thick. 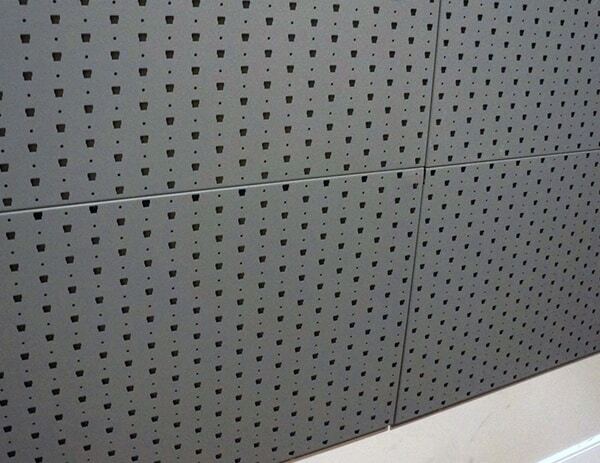 First up was using the magnets (stud finder) to locate the studs in the wall, then marking those areas with a pencil. Next, was positioning the support beam and using the level to ensure it was perfectly straight. 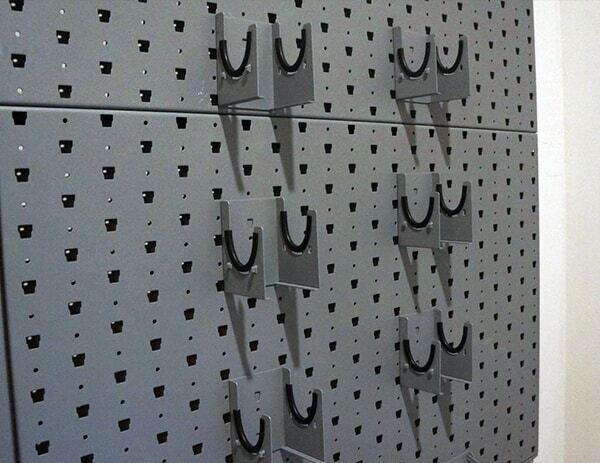 Once everything was lined up I drilled in two mounting screws. The process is the exact same for the second support beam. 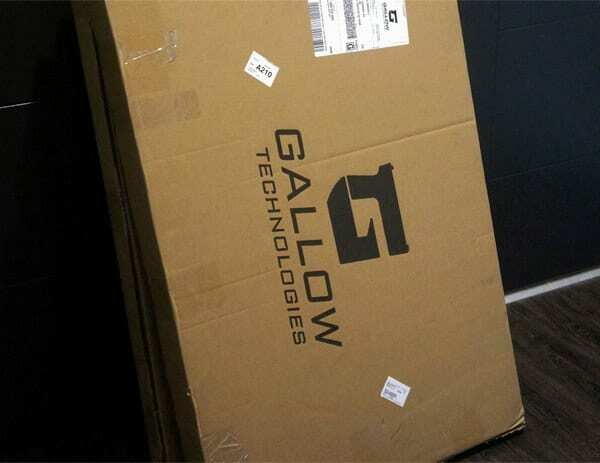 On all ends of both support beams you’ll find really nice rubber end caps with the Gallow Tech logo. While it’s a small touch, it does speak volumes about the fine level of attention Gallow Tech puts into the small details. 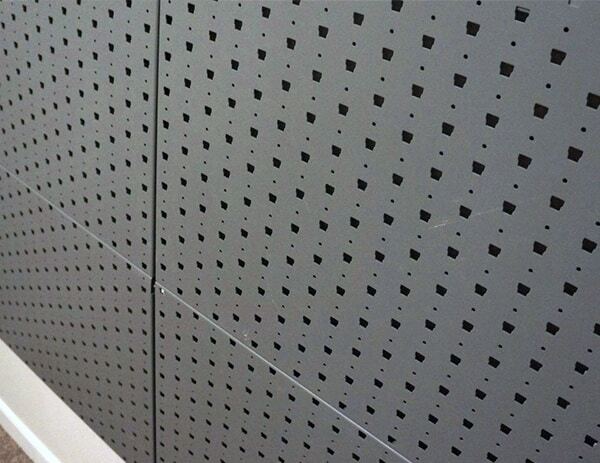 On the back of every top wall panels there’s a square cut out which allows them to simply slide right onto the support beam and lock in place. 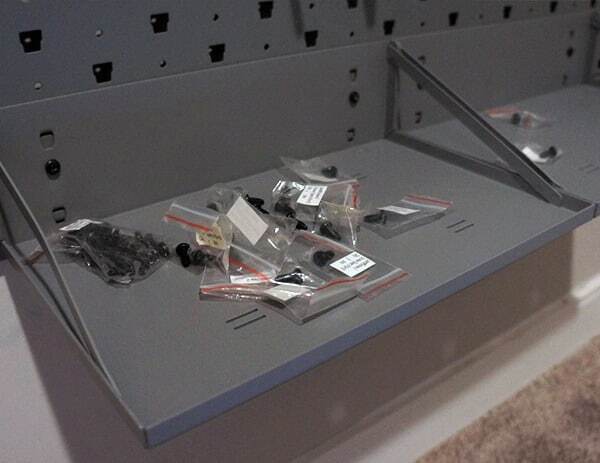 To secure them even further, four black screws are provided. 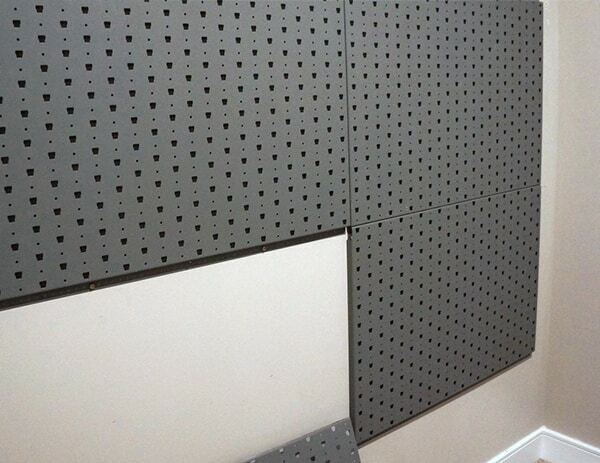 Before putting on the bottom panels, I needed to screw in two wall mounting screws first at the bottom of the panels. 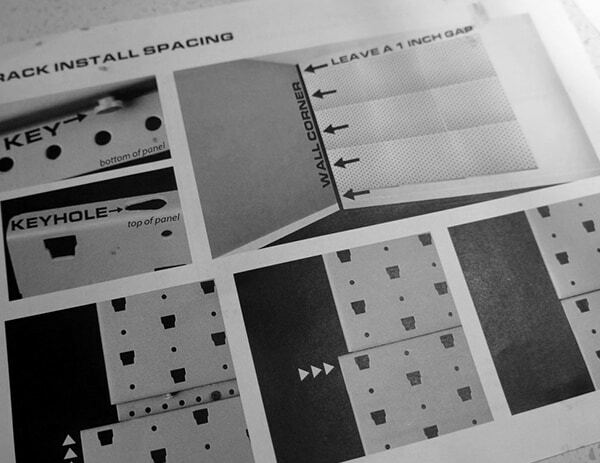 For installing the bottom two wall panels, there’s a unique locking system that latches onto the bottom areas of the top wall panels. 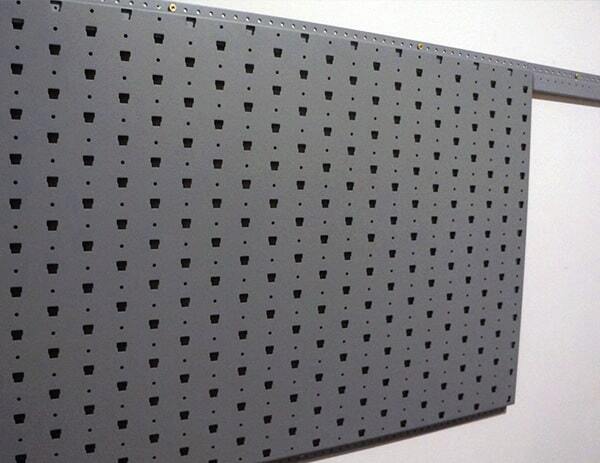 To finish, I again used two wall mounting screws per panel at the bottom to secure everything in place. 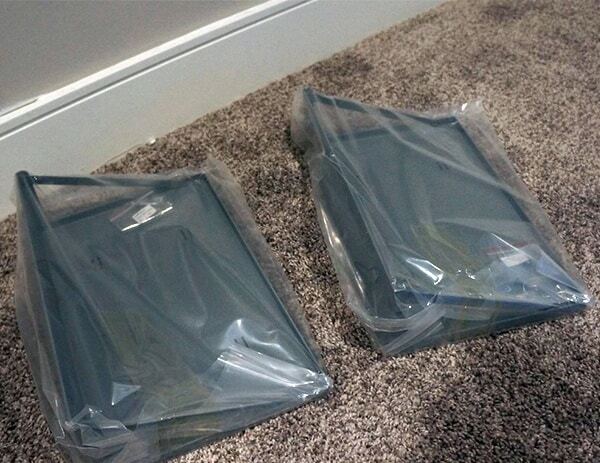 These were much easier to install than I originally thought they would be. 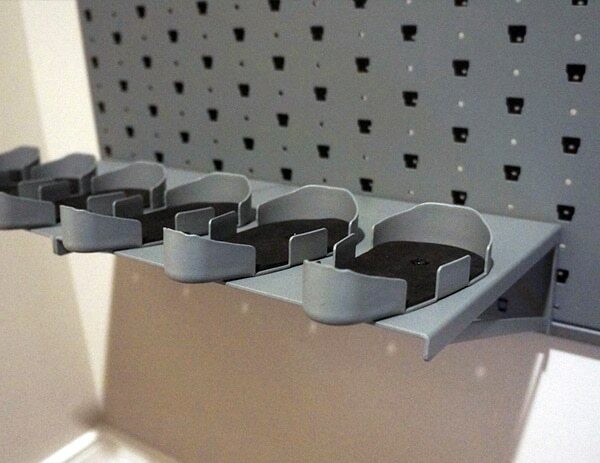 There are magnets throughout each piece allowing them to simply snap right in the tops and bottoms. 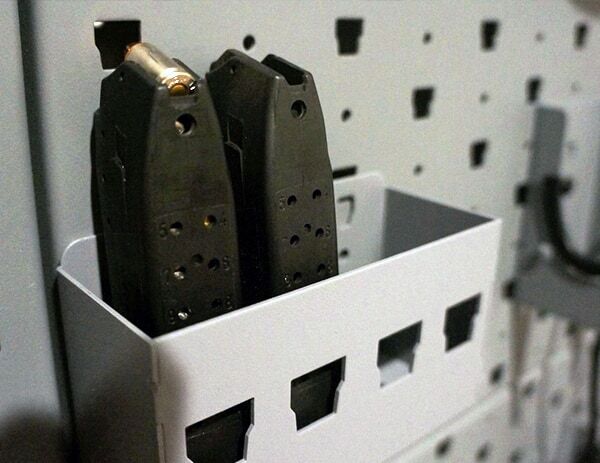 For added security, you’ll find the same unique locking system found on the bottom panels. 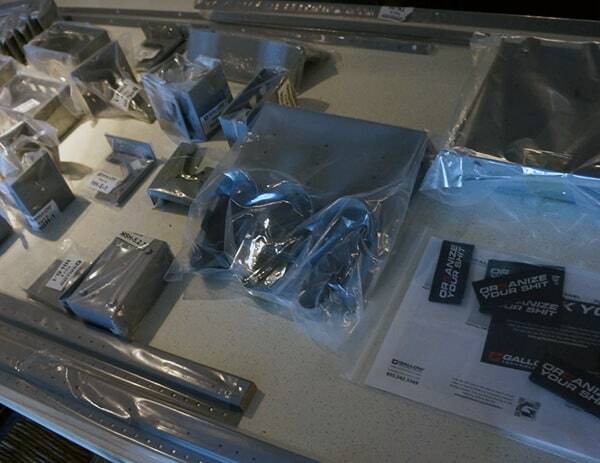 My favorite part of the install process. 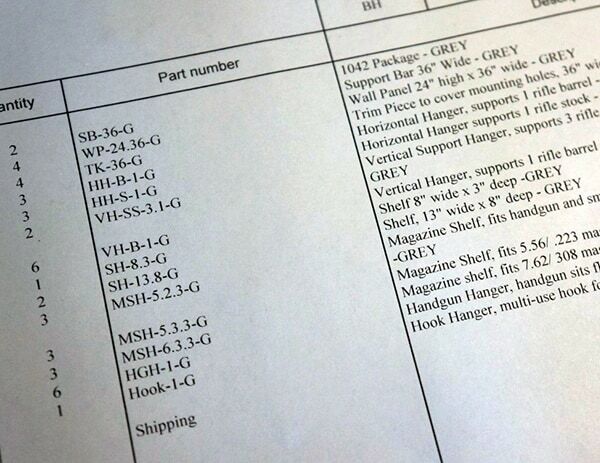 There are literally a million different ways you can customize your gun rack to suit your own personal needs. 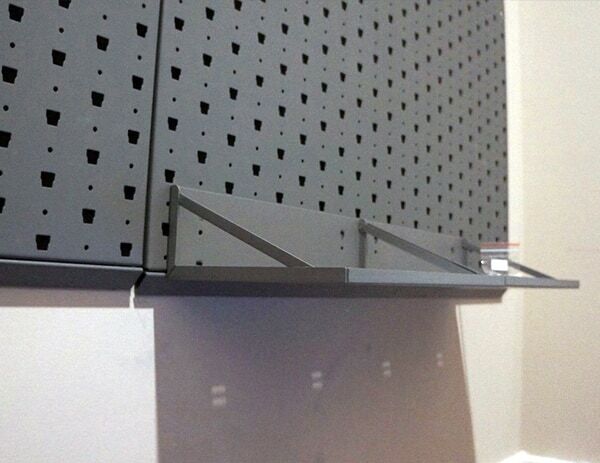 How it works is ridiculously easy: On the back of every modular shelf, hook and hanger you’ll find two protruding ends that lock into the open notches on the wall panels. 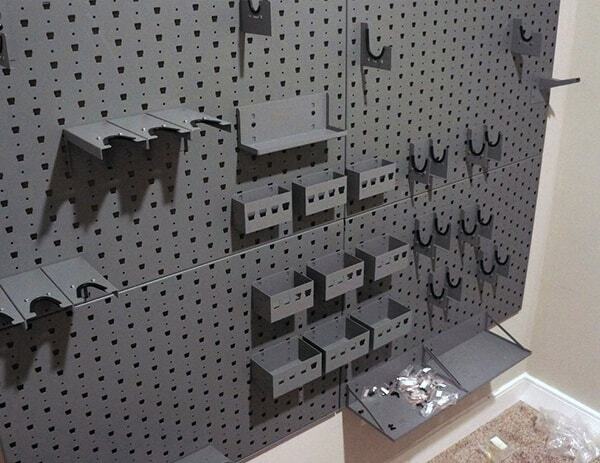 You can rearrange these modular pieces in seconds by just pulling them up out of the notches, and pushing them back down into the notches. 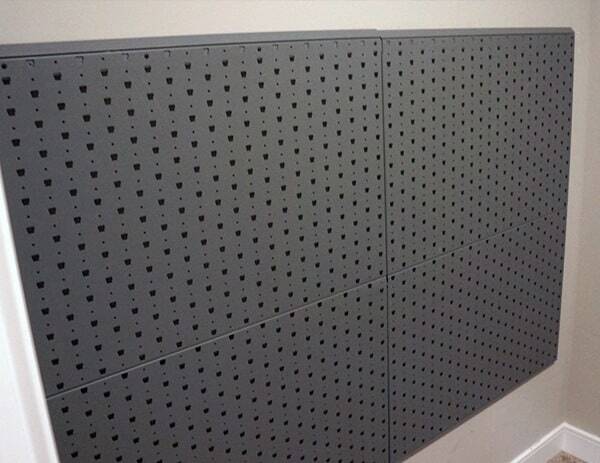 Once I had determined exactly where I wanted to, I used the provided black screws to secure them in place. However, even without the screws, the locking system is ridiculously rock solid. 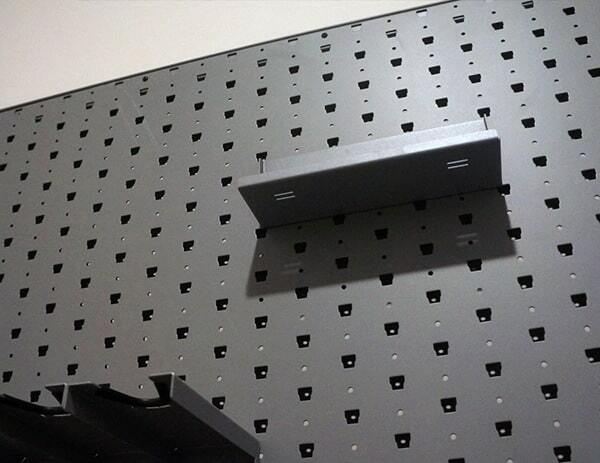 Gallow Tech’s unique design is leaps above the strength of slat board and peg board. It’s a night and day difference. 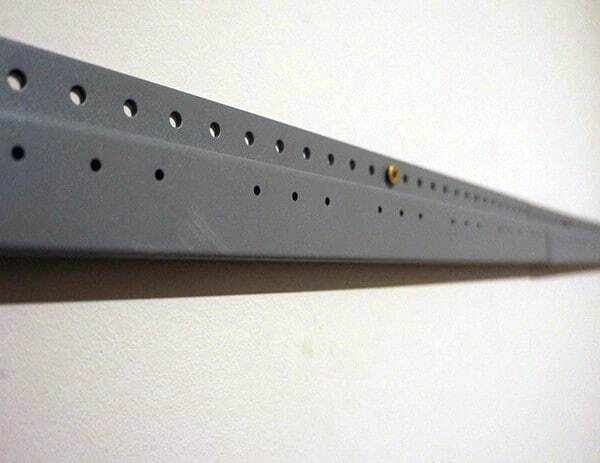 In the photos above you’ll find all the cool modular parts of the wall rack I used. 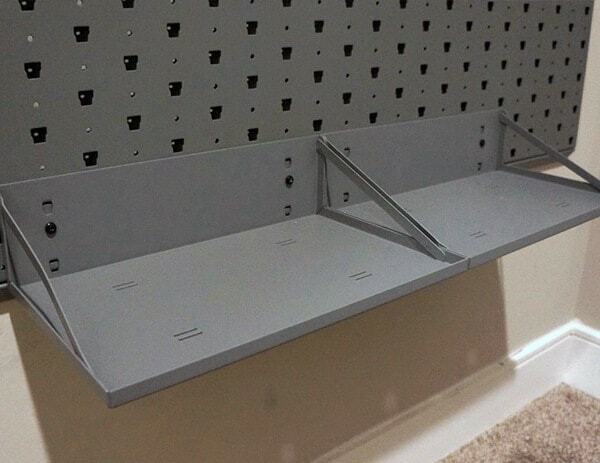 The 13″ shelf, 8″ shelf, handgun hanger, hook hanger, horizontal rifle barrel and stock hanger, .223, 308, and pistol magazine shelves, vertical rifle hangers, and many more. 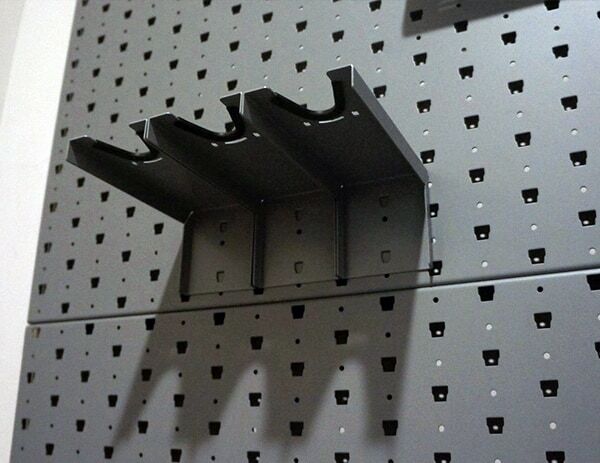 I am in love with this Gallow Tech gun rack! 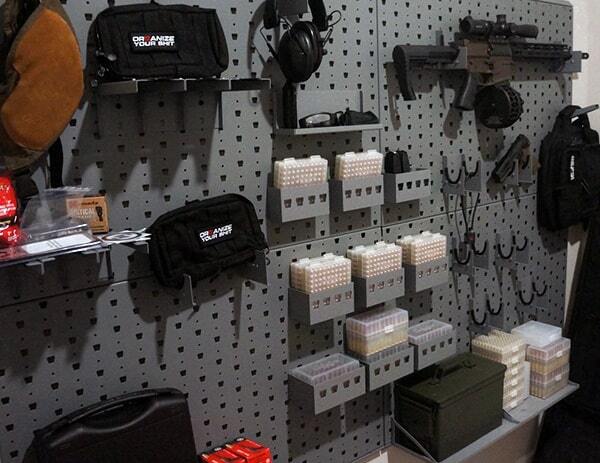 After standing back and taking a look at my new gun room I am speechless. Needless to say, it was worth every single penny. 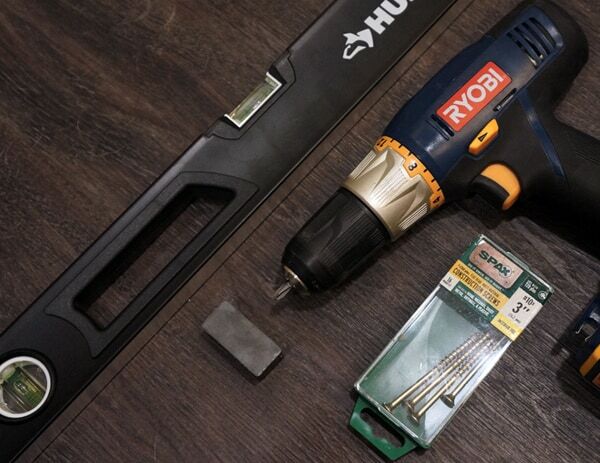 The craftsmanship of the heavy-duty 14 gauge steel paired with the grey power coat finish is truly top notch. Absolutely flawless. However, there’s far more to it than just those two great things. I’ll explain how my expectations were continually exceeded below. 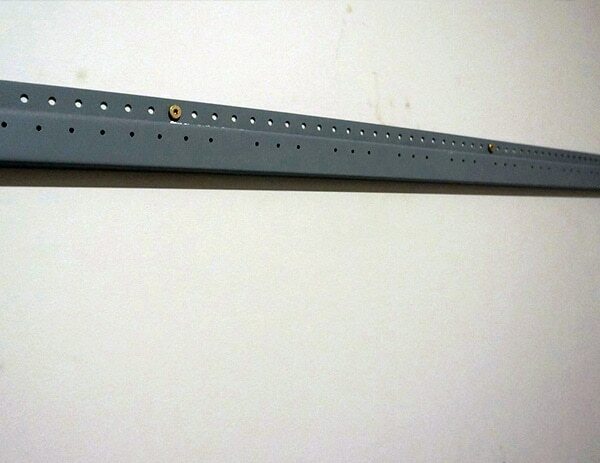 Sure, it’s a simple hook hanger, however, the way Gallow Tech does it is brilliant. 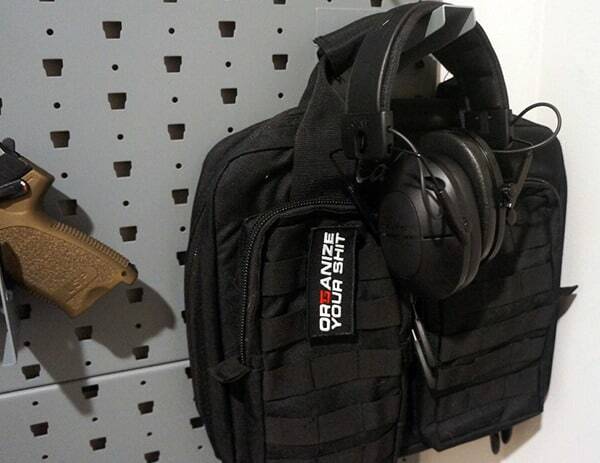 The design of the hook is long enough to fit my pistol range bag plus my 3M Peltor ear protection too. If I wanted to, I could fit a second bag or chest plate carrier on top of that too. Additionally, the edges on this hook are smooth as butter. 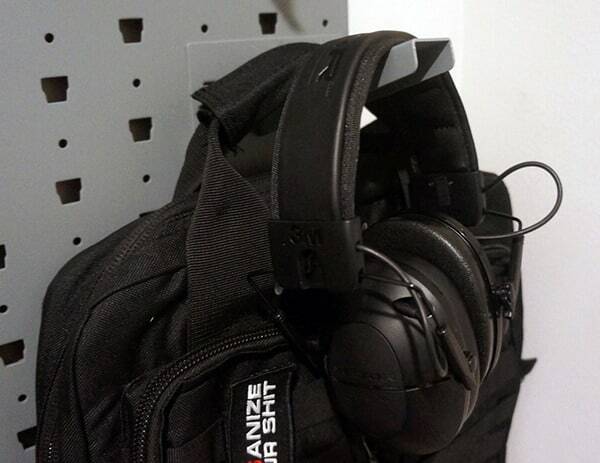 Not to mention, the hook’s angle of degree keeps your gear leaning back into the wall, keeping it neatly organized and out of the way. 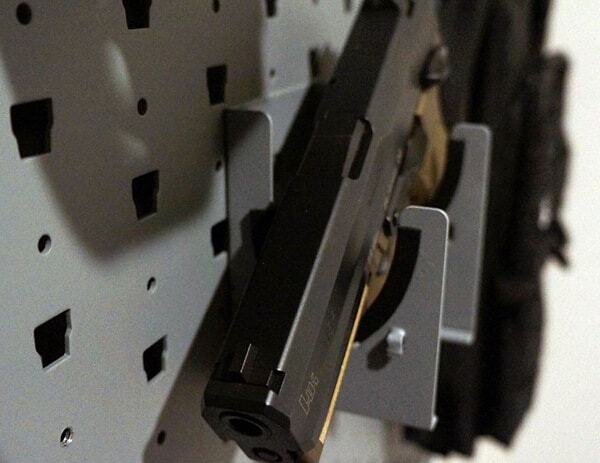 My HK USP 9 magazines fit four to a shelf and slip in and out effortlessly. 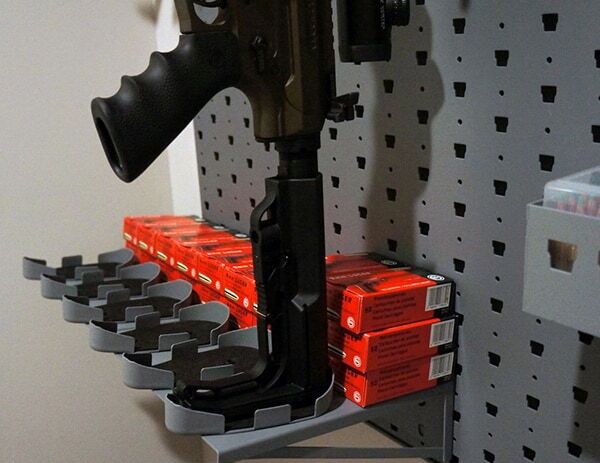 Surprisingly, even my .308 X-Products drum has plenty of room to fit in any of the three .308 magazine shelves. While my magazine collection is small, I still managed find other uses for those spare selves. 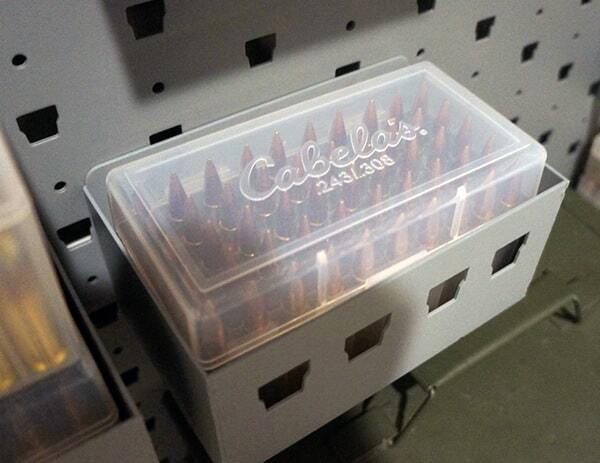 To my surprise again, my plastic Cabela’s ammo boxes made for a perfect fit. 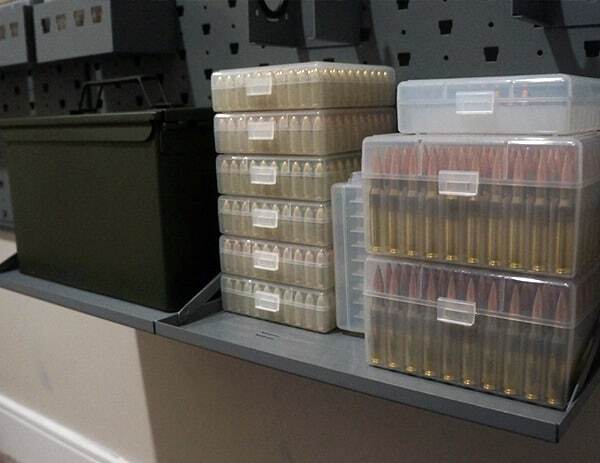 I was able to fit two, one-hundred round boxes per handgun shelf, and one, fifty round .308 ammo box per .308 shelf. Both of which, still slide in and out with ease. 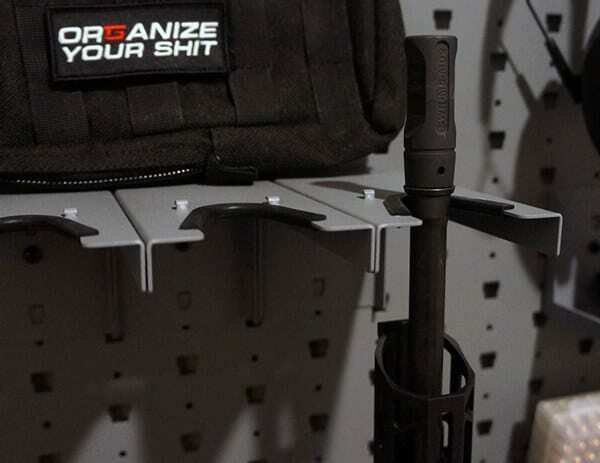 The rifle and handgun hangers hug my firearms securely in place with such precision. 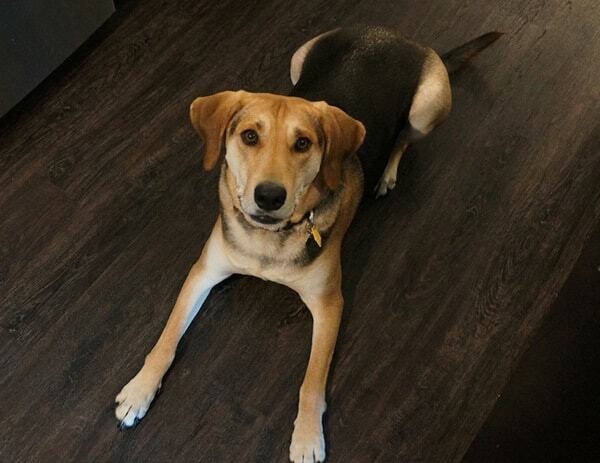 The soft rubber trim keeps them protected from any damage which leaves me absolutely worry free. 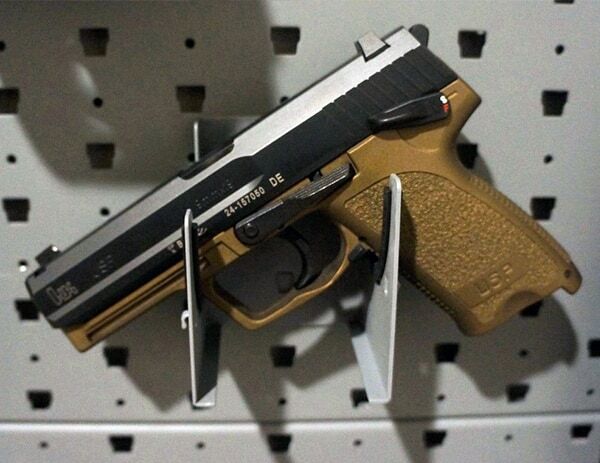 Even if I had pristine, fine vintage firearms, this is what I would demand for my collection. Not to mention, it’s a pleasure taking my .308 Salt Works Rifles M5 on and off the hanger. It extends out far enough to give me plenty of room without having to be overly awkward or careful about it. 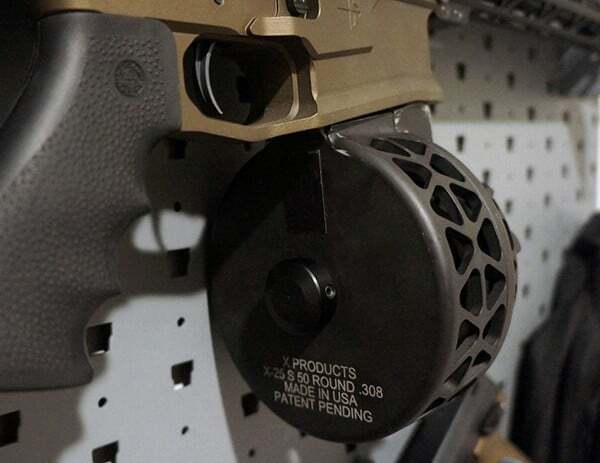 In the photos you’ll notice even the X-Products 50 round .308 drum fits along the way without pushing the rifle outwards. 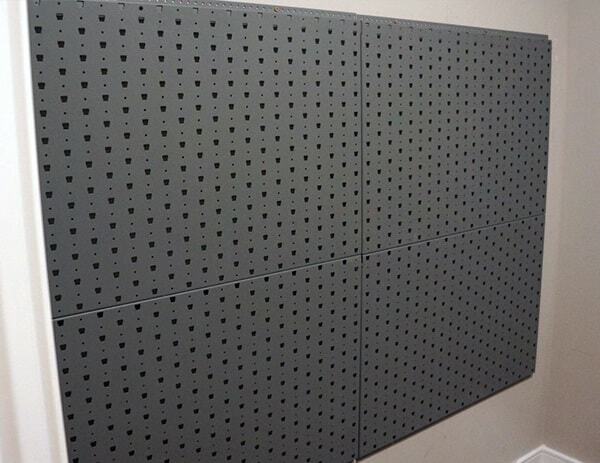 Believe it or not, but it doesn’t actually touch the wall, there’s still a small gap of room left so it doesn’t get scratched. In a photo I took above, you’ll also spot the SWR hanging at an angle. Using the horizontal hangers I was still able to pull off a nice, aggressive look without sacrificing any of the support. 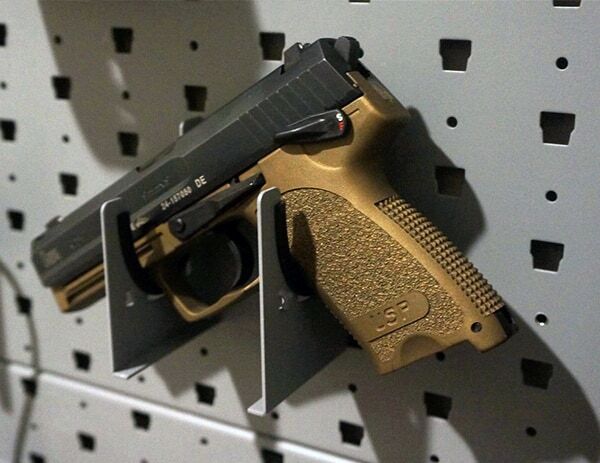 Of course, there’s also the burnt bronze HK USP 9 handgun hanger with Gallow Tech’s factory angled direction. 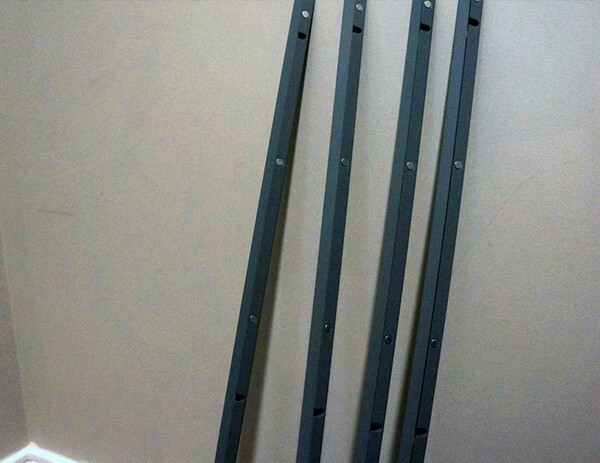 At the bottom of the stock hanger you’ll find thick rubber insets to protect your stock. Fitment is flawless. 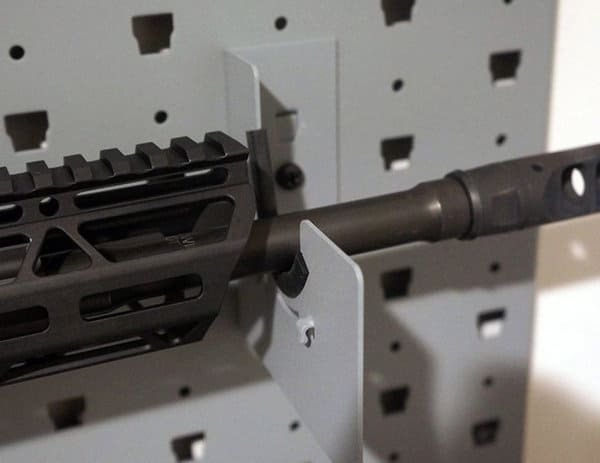 To keep things up right the barrel hangers can be adjusted, meaning if you have a long rifle you can move them upwards. 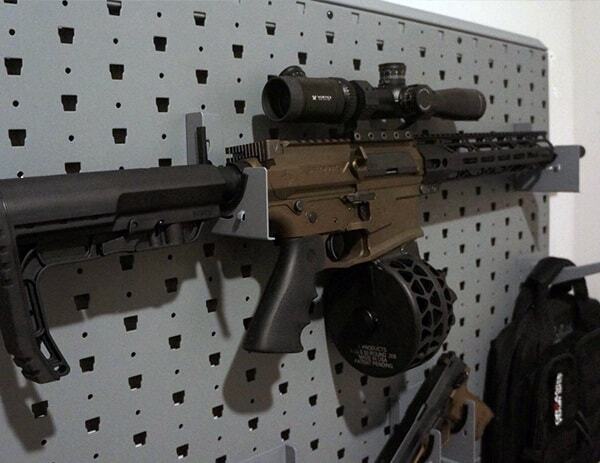 Or if you have a short barrel rifle, they can be moved down. No matter what length your rifle or barrel is, you’ll always be able to acquire a precise, secure fit for every single one. Additionally, Gallow Tech makes velcro securing straps too. I plan on ordering a few as my collection grows. 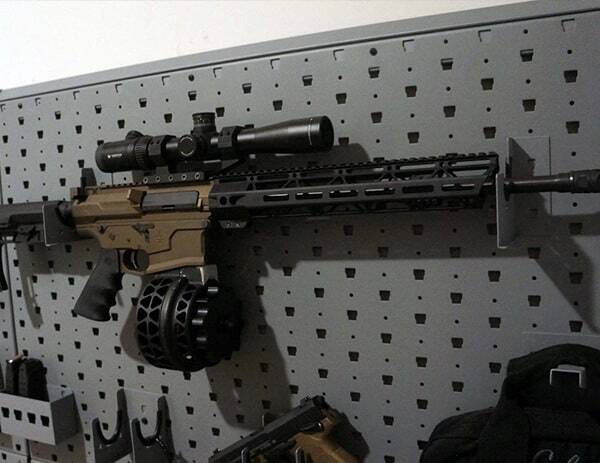 It’s worth noting that even with the heavy, 2.5 pound .308 drum plus 50 rounds attached, the rifle remained vertical and exactly in place where I put it. 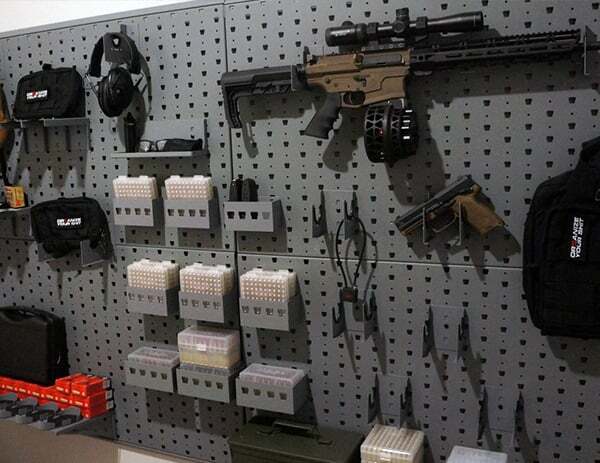 The bottom 13″ shelves are handsomely spacious and offered plenty of room to store a full 50 cal ammo can alongside nearly one-thousand rounds of 9mm plus 200 rounds of .308 ammo. I was really quite surprised by how much weight these could hold. 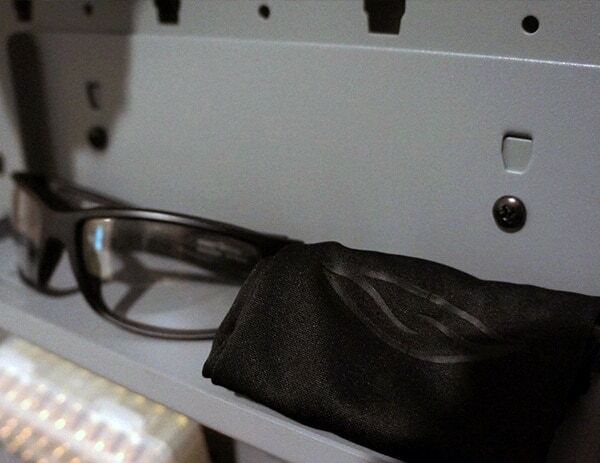 A perfect fit for my shooting glasses and protective sleeve cover. I was able to fit a few other small things on the shelf too including a bottle of Break Free CLP, cleaning pads, etc. So there you have it. 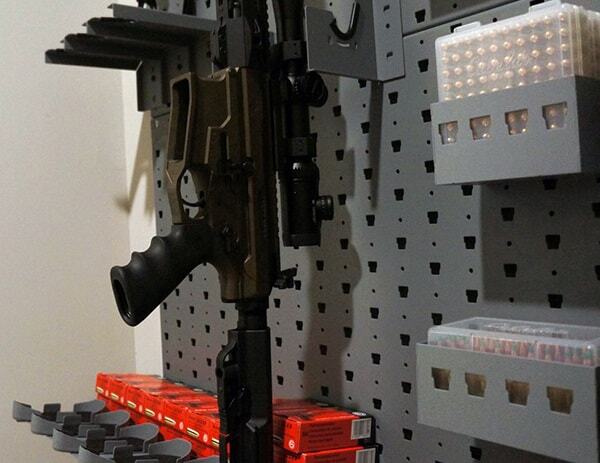 In my opinion, Gallow Tech makes the best gun rack solution out there. Nothing else even remotely compares, it’s truly flawless. The powdercoated 14 gauge steel screams craftsmanship and long-term quality that lasts for a lifetime. While installing everything I kept thinking to myself over and over, “Wow, they really put a lot of thought and time into designing this.” From the rock-solid locking system notches to the rubber protective trim, Gallow Tech doesn’t miss a beat when it comes to the larger and smaller details. Was it worth it? Every single penny. Sure, my collection is smaller than most but it’s growing. 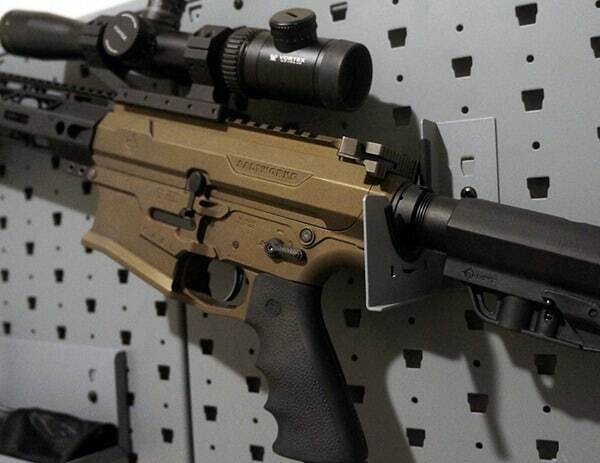 (I have my eye on a Wilson Combat CQB Elite and a Zev Technologies Glock next.) 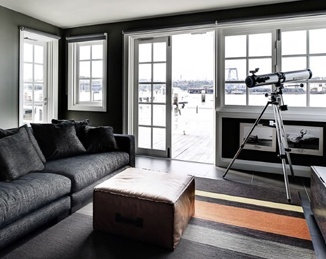 However, I must say, it’s rather nice having the all the space to work with. 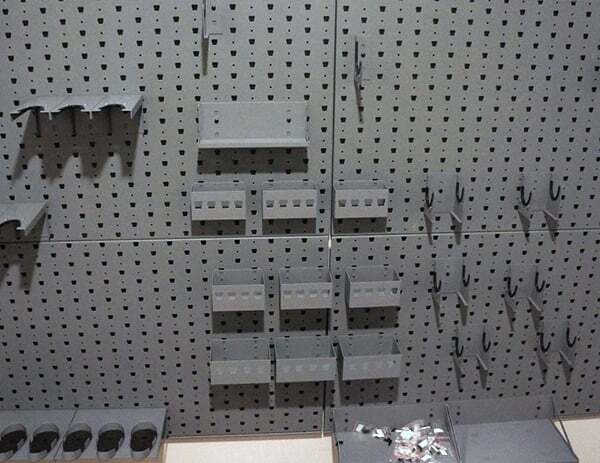 As soon as I fill up this wall I can order more panels and modular hangers in the future, and expand my gun room even further. 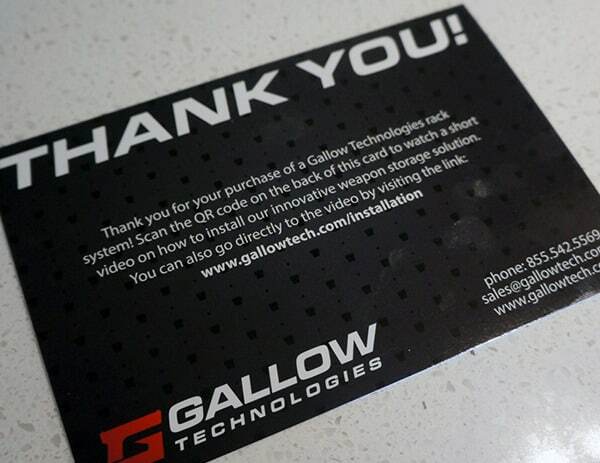 Perhaps that’s what I like the best about Gallow Tech, it’s truly customization for your specific needs. 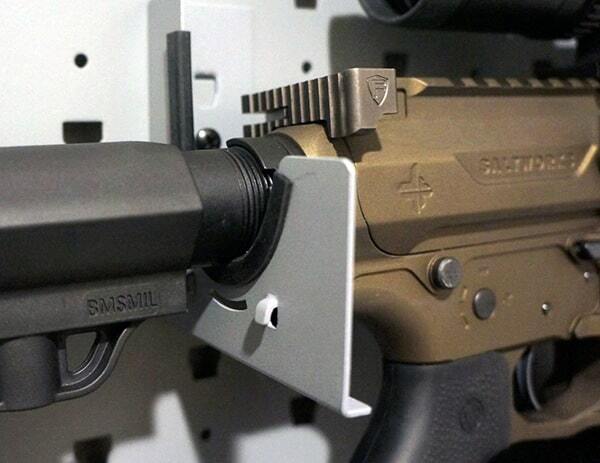 Both small and large firearms owners can greatly benefit from such an innovative solution that has long been needed. 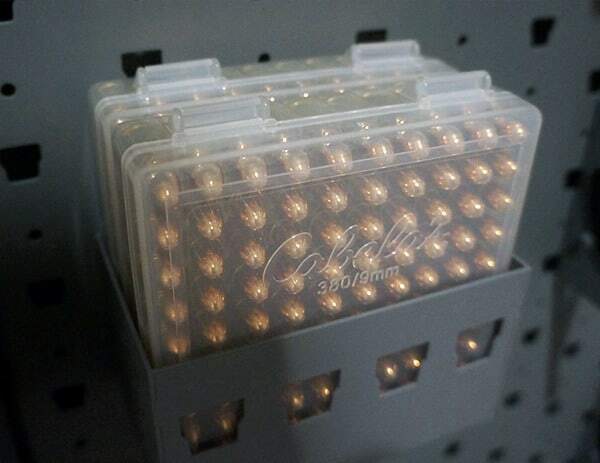 If you like staying organized and want a gun display storage setup that looks as cool as it works, go ahead and check out Gallow Tech. I’m sure you’ll be just as pleased I am today.